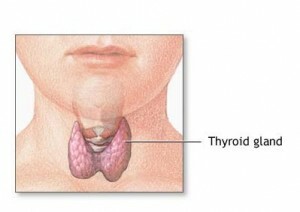 Thyroid diseases are disorders affecting the thyroid gland that disrupt one or more of the gland’s primary functions. The thyroid gland is an essential organ for producing thyroid hormones which regulate metabolic processes. In this post I’ll discuss the various types of diseases in more detail, including symptoms and treatments. Hypothyroidism results when the thyroid gland produces an insufficient amount of thyroid hormone. Symptoms of hypothyroidism can affect an individual both physically and mentally. Hypothyroidism can include physical symptoms such as fatigue, fluid retention, muscle and joint pain, dry skin, and constipation. Mental symptoms, such as depression, can also develop. The opposite of hypothyroidism, hyperthyroidism results when there’s an excessive production of thyroid hormone. This is less common than hypothyroidism, but still something you should be aware of. A goiter simply refers to an enlarged thyroid gland, regardless of cause. A goiter is not one of the thyroid diseases per se, but can be a sign of a more serious condition. A goiter may be associated with hypothyroidism, hyperthyroidism, or normal thyroid function. Thyroid nodules refer to lumps or abnormal masses within the thyroid. Nodules are not necessarily a cause for concern, as they can be caused by benign cysts or benign tumors. Although less commonly they may be caused by cancers of the thyroid. Nodules may be single or multiple and can vary in size. If nodules are excessively large, they may cause symptoms related to compression of nearby structures. Some nodules actively secrete hormone while others do not. Thyroid cancer is a condition that is more likely to affect adult woman than either men or youth. Two thirds of cases occur in people under age 55. The type of thyroid cancer is dependent upon the specific cell type within the thyroid that has become cancerous. When diagnosed early, most cases of thyroid cancer have a good prognosis and high survival rate. Thyroid diseases are usually detected during physical examinations, but specialized tests can be conducted to diagnose them as well. Blood tests can be conducted to measure your levels of thyroid hormone, and imaging tests can be conducted to detect any enlargement in the thyroid gland. If you suspect you’re afflicted with any of the above mentioned thyroid diseases, get an evaluation right away. It’s always best to detect these kinds of things early. Thyroid diseases can be treated by medications. In other cases surgery may be required. Treatment will depend on the particular thyroid disease. Medications can be prescribed to either increase or decrease your production of thyroid hormone. Other medications can also be given to treat symptoms, such as increased heart rate, that result from thyroid diseases. Sometimes thyroid surgery will be needed to remove a large goiter or a hyperfunctioning nodule within the gland. Surgery is necessary when thyroid cancer is diagnosed. With proper medical treatment, thyroid disorders can be well managed and are not life threatening. As mentioned earlier, the outlook for most people with thyroid cancer is also good. With that being said, conditions will not clear up without treatment, so please schedule a consultation as soon as possible if you believe you have one of these thyroid diseases.